We could have sworn that one of our commenters had already invented this, but maybe not. 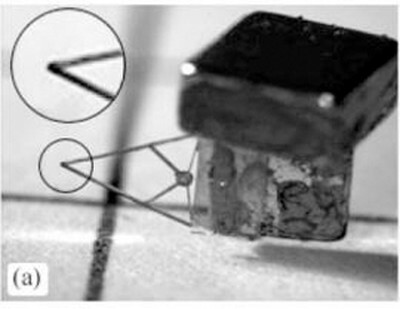 Researchers at the University of Waterloo in Ontario -- led by Professor Mir Behrad Khamesee -- has developed a microbot weighing in at about three-hundredths of an ounce that hovers and moves about on a three dimensional parabolic magnetic field. Altering the flow of the electromagnetic current distorts the field and propels the robot. Additionally, the device has pincers that open when heated by a laser, closing once they're allowed to cool. The device is monitored by laser sensors and by camera, and since the it floats free of any sort of wiring (and power is supplied from outside the robot) it is ideal for working in clean rooms or hazardous environments. Not too shabby, eh? At the very least, we got to use the word "microhoverbot."